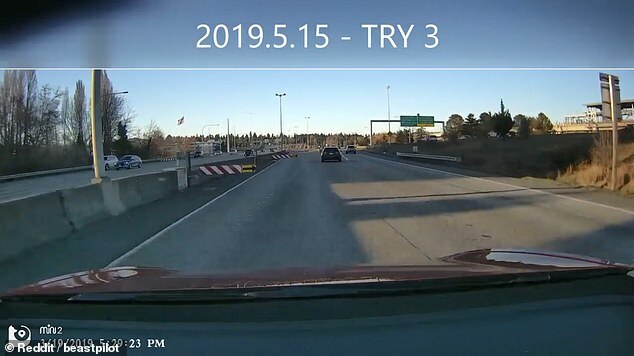 A shocking new video appears to show a Tesla autopilot driving the car towards a metal barrier, before the human driver is forced to take the wheel to avoid a crash. The video he posted seems to show the mechanism veering his sedan towards barriers in the road. During the first clip, the driver disables the autopilot and steers the vehicle to safety before it crashes into a median. 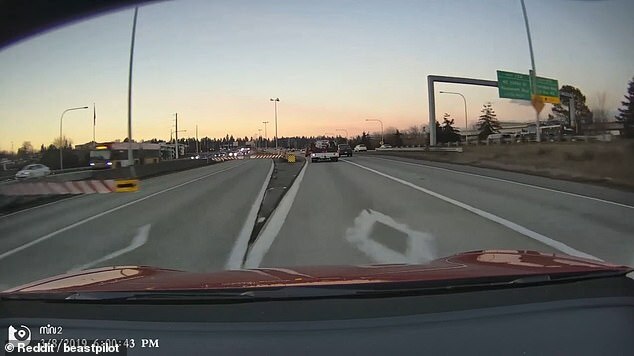 In subsequent attempts, the autopilot steers the Tesla towards the median to the left of the driver, setting off the vehicle’s proximity alarm. The apparent glitch happens at the same point on the same highway. Digg editorial director Dan Fallon spotlighted the video on his site on Friday. ‘​If you need further illustration of why you definitely should not sleep while Tesla’s Autopilot drives, this clip from Redditor u/beastpilot shows his Tesla Model 3 veering towards a barrier on three separate occasions, forcing him to take control and steer back to safety,’ Fallon wrote. Tesla drivers have died in recent years due to crashes allegedly caused by a malfunctioning autopilot mechanism. It is not yet clear whether autopilot was engaged. The circumstances are similar to the infamous 2016 fatal autopilot crash.